Fenestrae is an active member of the IHE, an initiative to improve the way computer systems in healthcare share information. Udocx fully supports the IHE standards for Cross-enterprise Sharing of Scanned Documents (XDS-SD) and the exchange via XDS and XDR profiles. Udocx also supports DICOM and HL7 standards. This allows for all information digitized with Udocx to be automatically integrated with other healthcare applications. 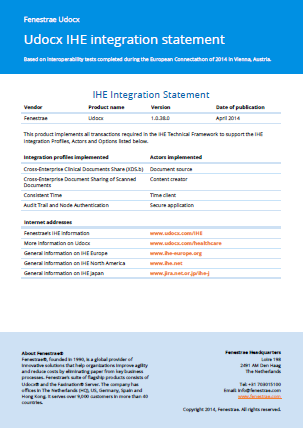 This IHE integration statement is based on interoperability tests completed during the European Connectathon of 2014 in Vienna, Austria.